Captain Graeme Smith perished in the last over before lunch as South Africa reached 111 for one at the break after bundling out India for a paltry 136 on the second day of the first Test at Centurion on Friday. After India faced just three balls in the morning session before Morne Morkel brought an end to the innings, the two South African opener Smith and Alviro Petersen seemed to be in no discomfort at all against the Indian seamers who failed to extract any movement on the Super Sports Park track. The pair put on 111 runs for the first wicket before off spinner Harbhajan Singh provided the breakthrough by evicting the dangerous Smith in the last over before lunch, much to the relief of the Indians. Earlier, resuming at the precarious overnight score of 136 for nine, India could hang around for just three balls before Morkel dismissed captain Mahendra Singh Dhoni. Dhoni was hit on the pad to a delivery that appeared to be going down the leg side, but the Indian captain walked even before the umpire had given any decision. Openers Smith and Petersen started cautiously but gradually opened up to unleash some fluent shots on both sides of the wicket. Sreesanth and Ishant Sharma bowled a tidy opening spell but hardly looked menacing as they did not have the sheer pace to torment the batsmen on the track, which had some bounce. Debutant Jaidev Unandkat was introduced into the attack in the seventh over of the innings and the experienced Smith welcomed him by spanking his third ball to the boundary. Peterson, who appeared circumspect early in his innings, played his first attaking shot by hooking Ishant Sharma to the square leg fence. He gradually grew in confidence to hit a few more boundaries. After the first ten overs, Smith and Petersen stepped up the pace of scoring as they despatched the loose deliveries to the boundary. 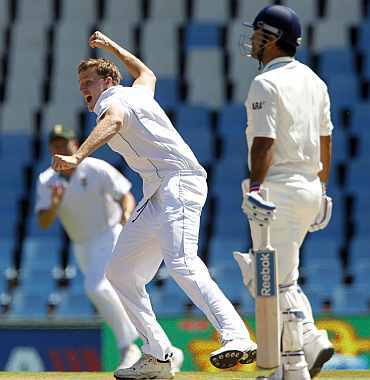 Smith set the momentum by clobbering Ishant for a boundary. In the next over, Petersen showed superb timing as he punched Unadkat to the long off boundary. South Africa's 50 came through a boundary when Smith cut Sreesanth off the front foot through backward point. In the next over, Unadkat angled the ball across Petersen on a good length and the right-hander played a flashy drive. The ball took the edge and flew wide of the fielder at gully. As the innings wore on, Petersen seemed more and more confident and even singled out Harbhajan Singh for special treatment, lifting the off-spinner for a mighty six. Just when it looked like hosts would go into lunch without losing a wicket, Harbhajan got into the act by getting the vital wicket of Smith, who notched up his 29th half century in Test cricket. The South African captain attempted to cut a ball drifted into the left-hander and only succeeded in edging the ball to wicket-keeper Dhoni. His knock of 62 came off 87 balls and contained 11 boundaries. 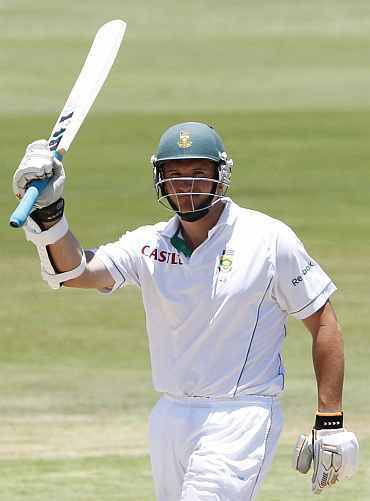 Petersen struck a sparkling 77 as South Africa increased their first innings lead to 100 at tea. 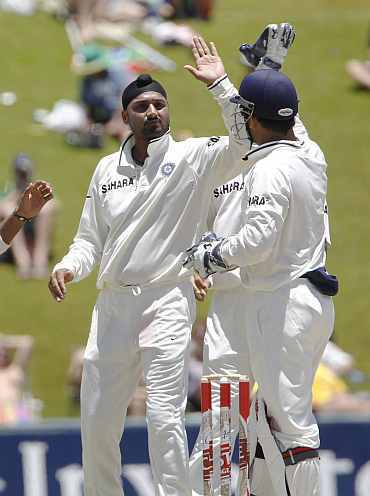 Resuming at the lunch score of 111 for one, Petersen and Hashim Amla put on 55 runs for the second wicket before Harbhajan Singh struck for his team again. The Indian bowlers lacked the sting in the post-lunch session and barring Harbhajan, who managed to get the odd ball to jump up, none of them really looked like getting a wicket. The Indian pacers got no movement whatsoever in the session and the absence of pace spearhead Zaheer Khan, who is sitting out of the match because of a hamstring injury, was badly felt. 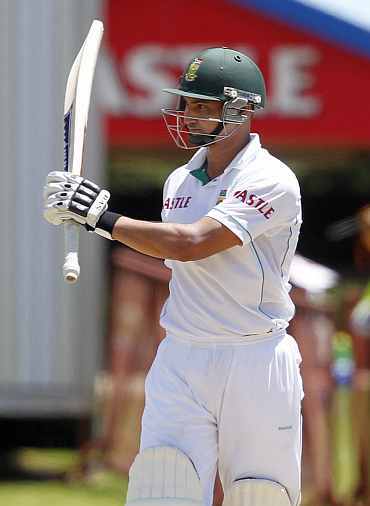 Petersen took upon himself the task of scoring the runs after the dismissal of his captain Graeme Smith and completed his third Test half century shortly after the lunch break. Petersen was particularly severe on Ishant and Sreesanth and even Harbhajan was not spared when he erred in line or length. Harbhajan plotted Petersen's dismissal as he flighted the ball on middle and leg stump. Petersen got half-forward to defend and got an inside edge onto pad for Gambhir to take a smart catch at forward short leg. Petersen looked quite comfortable in the middle till this blemish. His knock of 77 came off 114 balls and was laced with nine boundaries and a six. Amla and Kallis then got together and made the visitors pay for some inconsistent bowling. Amla also made his intentions clear by clobbering Harbhajan for a six and was not afraid to play the sweep shot to balls pitched outside the off-stump. Jacques Kallis too joined the action as he smashed a Sreesanth delivery for a boundary. Indian captain Dhoni introduced part-timer Suresh Raina into the attack in place of Harbhajan and he turned out to be really expensive with Kallis smashing him for two sixes. He conceded 23 runs in his two overs. 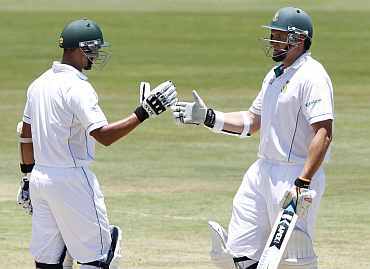 Soon Kallis brought up his 38th Test ton with a double off S Sreesanth, while Amla reached the milestone -- his 12th century -- in style with a smashing pull off Ishant Sharma. 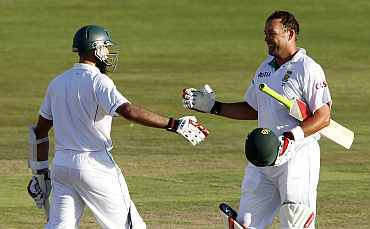 Amla and Kallis' unbeaten centuries ensured South Africa are 230-run ahead, with still three days to go.